Archived 29 July 2013 at the Wayback Machine. 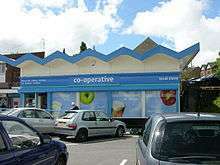 The Co-operative is a common branding used by a variety of co-operatives based in the United Kingdom. Many in the UK consider 'the Co-op' to be a single national business, whereas the brand actually represents a number of different consumers' co-operatives spanning various sectors. The Co-operative Group is the largest consumer co-operative in the UK and the biggest user of the Co-operative brand in its 4,500 trading outlets. Many independent retail societies in the UK trade as "the Co-op", and many, such as the Midcounties Co-operative and the Central England Co-operative, use the latest incarnation of the common brand. Most co-operative societies have businesses in many different areas; however, the largest areas of the businesses are in food stores, particularly convenience stores, thus the largest and most visible use of the branding is as The Co-operative Food. The Co-operative brand as it is widely used today came about as a result of the Co-operative Commission's report into the British co-operative movement which recommended that all UK consumers' co-operative societies switch to a universal recognisable co-operative brand. This single brand would be in contrast to the previous array of brands which had existed up to this point including the '1992 Cloverleaf', the 'Co-op Welcome' and 'Co-op Late Shop' brands which was understood by the commission to be holding back the public's perception of the co-op sector's modernising approach. Not all of the UK's consumers' co-operative adopted the resultant 2008 version of The Co-operative brand with the Lincolnshire Co-operative and Scotmid being notable examples. At The Co-operative Group's 2016 AGM, it was announced that the Group would go back to a revitalised version of the 1968 Co-op 'cloverleaf' design, utilising a uniform blue through all business areas. Following the success of the Rochdale Pioneers, co-operative shops were established across the UK and took customers away from private traders who responded by making it difficult for co-operatives to source quality goods to sell to their members. The solution was for co-operative retailers to come together in 1863 and form the Co-operative Wholesale Society (CWS) (now the Co-operative Group) responsible for sourcing and producing goods for sale in its members' shops, and for unified marketing and branding for the societies. The CWS carried out this role for members for nearly 100 years, and in 1968 launched "Operation Facelift", which resulted in the first national Co-op logo. The movement's cloverleaf logo created the impression that it was a single organisation rather than independent organisations sharing common principles. The brand was strengthened by the creation of the Co-operative Retail Trading Group (CRTG) in 1993, providing Co-op branded products and other food supplies to its members: by 2002, the CRTG provided 100% of food supplies sold by UK consumer co-operatives. Over time the brand became tarnished by inconsistent customer delivery and image perceptions of the cloverleaf logo were irreparably damaged. Market research carried out in the early 2000s showed a consistent decline in consumer ratings. The Co-operative Movement called on then Prime Minister, Tony Blair, to establish a Co-operative Commission to consider ways to ensure the survival of the co-operative business model into the 21st century. The commission, chaired by John Monks, published its conclusions in January 2001 making recommendations regarding branding. Most important were that a panel representing all sections of the movement should be established to monitor and maintain the positive image of the brand, and that it should consider the "cloverleaf" logo's future. The Co-operative Group's designers and marketers collaborated with Harry Pearce and John McConnell of the designers' co-operative Pentagram, to develop a new identity to represent "The Co-operative". The selected artwork was based on a sans serif bold lower case (Neue Helvetica) logotype for the wording, with different colours representing different businesses. It won a silver award from the Design Business Association. The brand was trialled between 2005 and 2007, at several outlets of the Co-operative Group, Scotmid, United Co-operatives and Midcounties Co-operative. 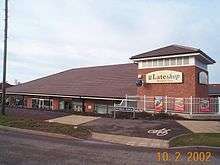 A 2007 pilot programme of 115 shops saw sales rise by 15%, beating the 4.6% increase at stores using the 1993 cloverleaf. The brand was introduced to food packaging in 2007, and officially launched in 2008. 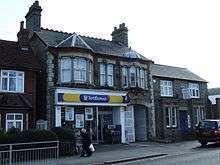 It was used in national advertising and a national programme of store refits. Example of the 'Cooperative' branding from Holcombe, Greater Manchester. As of May 2016, the Co-op group have reintroduced and updated the 1968 logo and are moving to phase out the co-operative logo in favour of the cloverleaf. This transition includes refreshing all Co-op branded products, within vast areas of the group including Food, Funeral care and insurance. The roll-out of the refreshed design was announced at the group's 2016 AGM and is expected to be completed by the end of 2018. The Co-operative Academies Trust Academy Trust Academy Trust operating eight schools in the north of England. The Co-operative Bank The Co-operative Group Retail banking and commercial banking, now 80% owned by private investors. The Co-operative Business Telecoms The Phone Co-op Fixed-line; and DSL and fibre broadband services to organisations. The Co-operative Childcare The Midcounties Co-operative Day child care provision. The Co-operative Credit Union The Co-operative Credit Union Savings accounts and credit) for employees and members of UK co-operative businesses. Other retail co-operatives Online-only electrical retailer of Group, and used by other cooperatives as brand of in-store electrical departments. The Co-operative Estates The Co-operative Group Real estate division. The Co-operative Food Majority of Retail co-operatives Convenience stores and supermarkets. The Co-operative Flexible Benefits The Midcounties Co-operative Employee benefits. The Co-operative Florist Retail co-operatives Florist. The Co-operative Funeralcare Retail co-operatives Funeral director. The Co-operative Healthcare The Midcounties Co-operative Pharmacies. The Co-operative Independent Living The Southern Co-operative Mobility Aids, Daily Living Aids. The Co-operative Insurance The Co-operative Group Home insurance, Vehicle insurance, Pet insurance. The Co-operative Legal Services The Co-operative Group Family law; will and testament creation and storage. The Co-operative Mobile The Phone Co-op Mobile telephony. The Co-operative Party The Co-operative Party UK political party representing the interests of the cooperative movement, linked to the Labour Party since 1917. The Co-operative Phone & Broadband The Phone Co-op Fixed-line; and DSL and fibre broadband services to individual consumers. Retail co-operatives Travel agent and travel insurance. Membership is crucial to co-operatives and more than 8 million people are members of co-operatives in the UK which use 'The Co-operative Brand'. Members of co-operatives get to be democratically involved in the running of the society, often with votes on key business decisions and for the election of board members. It is also common for members to be provided with a share of the society's annual profits which is proportional to the amount of money that an individual has spent with the society over the year. This share of the profit is commonly referred to as the co-op's dividend. The size of the dividend varies depending on the financial performance of the group. Membership of the majority of consumers' co-operatives in the UK was brought under one identity in 2008 as a part of the launch of 'The Co-operative Brand' however each individual co-operative retains its own individual membership scheme. Members of these societies are given a card which all look very similar but which will list the specific co-op which the individual is a member of on the front. As a part of their membership schemes, many of the larger co-operatives which have adopted 'The Co-operative Brand' will allow members of other co-operatives to earn a share of their profits in a reciprocal agreement. This is particularly the case with those co-ops which have interests in supermarkets, whereas other users of the co-op brand, such as The Phone Co-op operate entirely independent membership schemes. Because it facilitates democratic engagement with the co-operative and because it is also a profit sharing mechanism, The Co-operative Membership scheme differs from loyalty cards which many other businesses offer. ↑ "Co-op hopes to leave the past behind with revival of its classic 60s look". The Guardian. Retrieved 25 August 2016.